ReQueue remembers the last queued content so that you can queue again by either using the slash command or by making a macro to put it on one of the action bars with "/macros". Since it might happen that you accidentally solo queue after making a group it now opens a window to warn you about that. This also works when you use the content finder to queue. 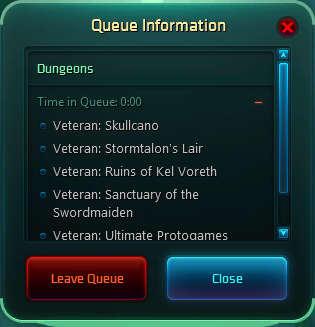 If you want to see the current queue status simply hit the same macro again and it will show or hide the queue status window. It will automatically accept a role check which can be turned off in the config menu accessible via /rq config and the esc menu. To change your roles without opening up the content finder /rq roles can be used. Display a warning when trying to solo queue in a group. Also works when using the content finder. Save the last queue content in settings to prevent /reloadui and restarting the game from resetting it.